Last edited by the_jersey_lilly_2000 on Mon Apr 04, 2011 8:11 am, edited 1 time in total. Aren't old photos just awesome? Thanks for the entries, folks. They are good ones! #2 is priceless to me... I can't wait to hear about that one..
Re # 3 That is Sullivan crossing isn't it?? Oh cattle painted by Bert Smith?? 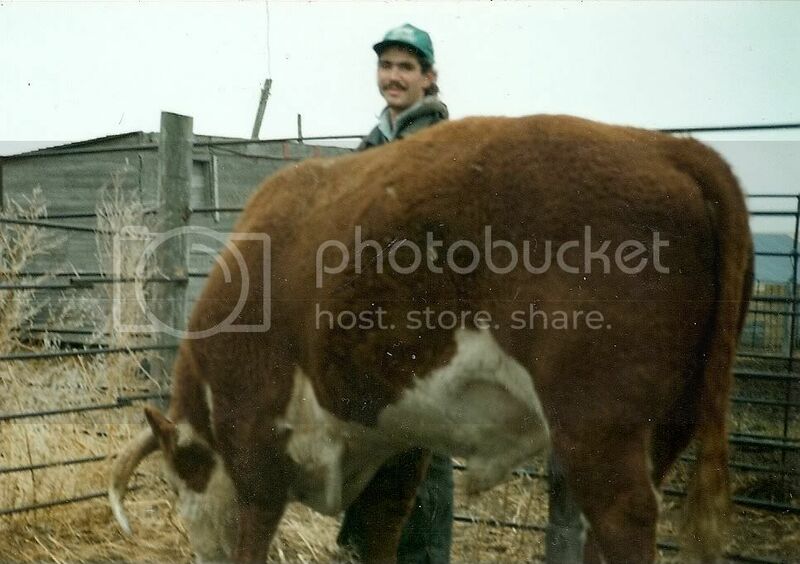 My uncle still feeds his cattle the same as pic 4 ,he inherited the family farm that had been established in the 20's. Stories of the entries, please!!! JD balerman told my story. are cows being trailed there? Whose cows? When was this? 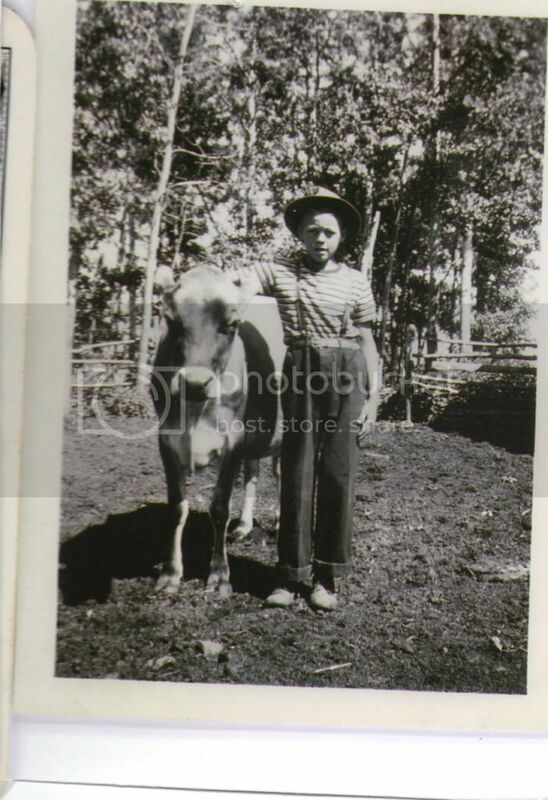 Bert Smith was a cowboy who got bucked off in his younger years and couldn't cowboy any longer. He lived in Longview and became a writer and Artist. He would hitch hike to High River several times a week and always carried a book and wrote your name and a bit of the story of the day in it when you picked him up. He never walked too far to get a ride as we all knew him and he was quite an interesting passenger. The Sullivan crossing is west of Longview on the Highwood river and the cows are being trailed to the winter range from the main OH ranch. They cross there and at a crossing on our place as well and trail only about 10 or 15 miles south. Not sure of the time period, the OH still operates but the Winter pasture was sold last year. 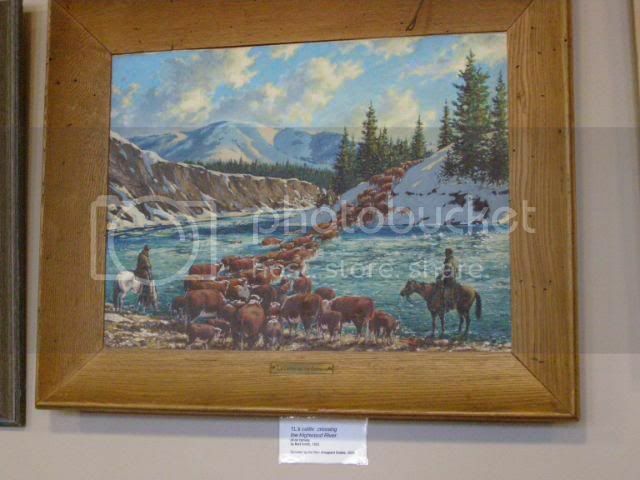 The painting hangs in the Stockmans (Bert Shepard) Memorial Museum at the Ranche House in Cochrane. Bert Smith must have been an interesting fellow. Did he write a book? If so, is it still available? That's a really neat painting. Thanks for entering it. This photograph was taken in either late 1977 or early 1978. While I was driving the team or standing out front snapping photos, the other guy was pitching hay and doing all the work. This is a habit I acquired early in life. The man on top of the stack was Mike Paulick, who was a hired hand at Dad's ranch at the time. The horses were from left to right: Rowdy, Bonnie, Rock, Rye, Babe, and Misty. The four inside horses were purchased from Buck Buckles in late August of 1977. He and his crew had that summer contracted the haying at the Star Ranch, south of Rushville. Tractors did the mowing, but horses were used for raking, sweeping, and pulling the loads up on the beaverslide stacker. Buck knew I was in the market for some work horses. He had quite a few younger horses coming on, so Rock, Rye, Babe, and Bonnie were for sale. They were all getting up in years, but still had some good left in them. The weigh-up market was pretty decent at the time, and he thought they would bring $500 apiece over the scales. He priced them to me for $600 apiece, and I was delighted at the chance to own these seasoned and gentle horses. The day before I went to look, the horses had been trailed from the Star Ranch to corrals on Highway 27 south of Gordon. Buck and I took his pickup and four-horse stock trailer. Buck's son, Jerry, hauled down a wrangle horse in a smaller trailer. It was approximately a sixty mile drive by vehicle to these corrals. We left about daybreak, and by the time Buck and I arrived, Jerry was jingling in about 40 draft horses out of the pasture. This was quite a picturesque sight, and I kicked myself for not bringing along a camera. Buck is always a great story-teller, and it was well worth purchasing the horses just for the adventure of the day. 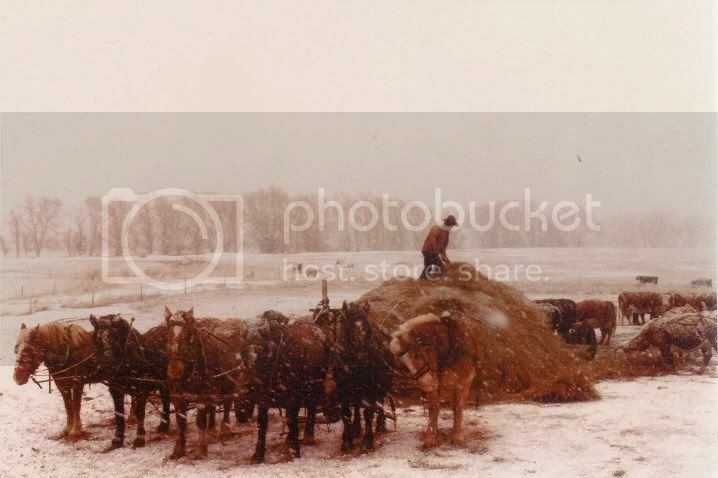 The four I bought all had Metzer's Half Diamond E brand on their shoulders, and had been used all their lives for either putting up hay or feeding it out. The Half Diamond E Ranch is south of Merriman, and is now owned by Chris Abbott. Most of our conversation that day centered around the golden olden days of ranching, but one of the topics that did come up was the recent demise of Elvis Presley. Both of us came to the conclusion that even though Elvis was quite a hallmark in the music world, life as we knew it would probably go on.